Cardinal discovers the depths of Administrator's depravity in her plans for the human realm. Eugeo counters Administrator with a weapon of his own choosing. Last episode, it was made clear that Administrator cares nothing for the people in this world and that control is the only thing that matters to her. More of those themes and personal philosophies were put out into the open as she continued her conversation with Cardinal from 200 years ago. Love is to be controlled, and desire for that love is the power behind the sacred arts. Cardinal, since she's the good guy, doesn't see it that way. Love is the yearning for bonds, and the desire to protect those bonds is the power behind the sacred arts. They finally got to settle that argument using the Sword Golem and Eugeo. The Sword Golem turned out to be way more twisted than was previously presented. 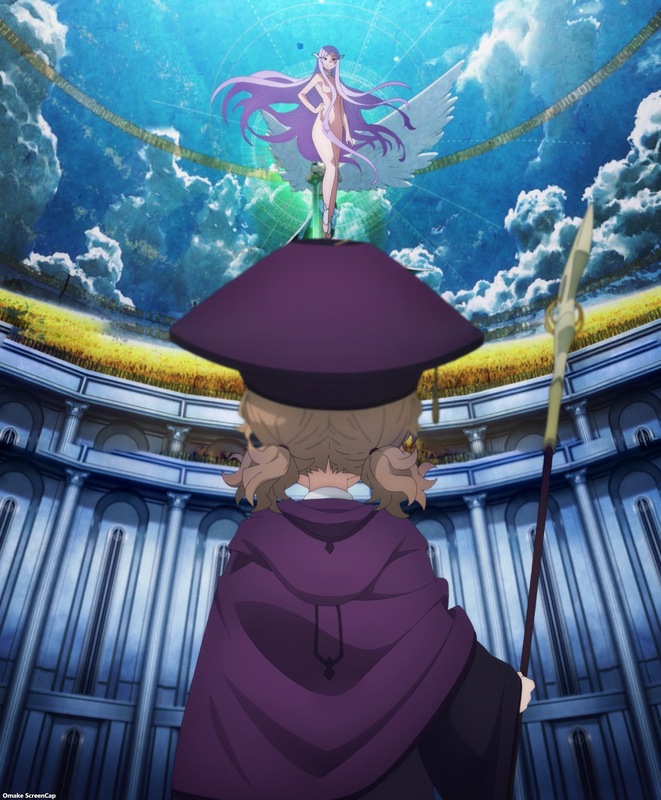 Each of the weapons in it was a person converted into a weapon from a combination of a memories of souls and the person holding those memories with a divine object weapon. Eugeo went through the same procedure, using the Blue Rose Sword, the memory fragment of Alice that Administrator had taken from him, and his own self. It was one person against three hundred. Apparently, free will and true love are stronger, as it should be in a simple heroic morality play. Administrator did not learn that lesson, well, because the principals all died (or so it would appear) from expressing the greatest love, giving one's life for the sake of their friends. It's not a coincidence that agapé, sacrificial love, the Love of Jesus Christ, was connected to Eugeo's cross pattern during his transformation into a weapon. Besides those themes coming to their narrative conclusion and we finally get to Kirito showing his badass self against the final boss, next episode in the finale of course, there were some stray bits of info from Administrator that piqued my interest. We knew from last episode how much she knew about the outside world, so it was pretty revealing that she claimed that she might see Kirito on the "other side" after she kills his body in Under World. She also claimed "that person" would fill her in after she's done taking her nap about the aftermath of Cardinal dying and the human player getting booted forcefully from the game. I guess she doesn't know about save points? I speculated that she was in contact with one of the devs, and this might be another hint at that. Also, one more big hmm from me - what if there was another team running the artificial soul program on the Dark Territory side, except without any constraints on interference? What if Administrator was communicating with one of those guys, which would explain why she had Minion gargoyles? 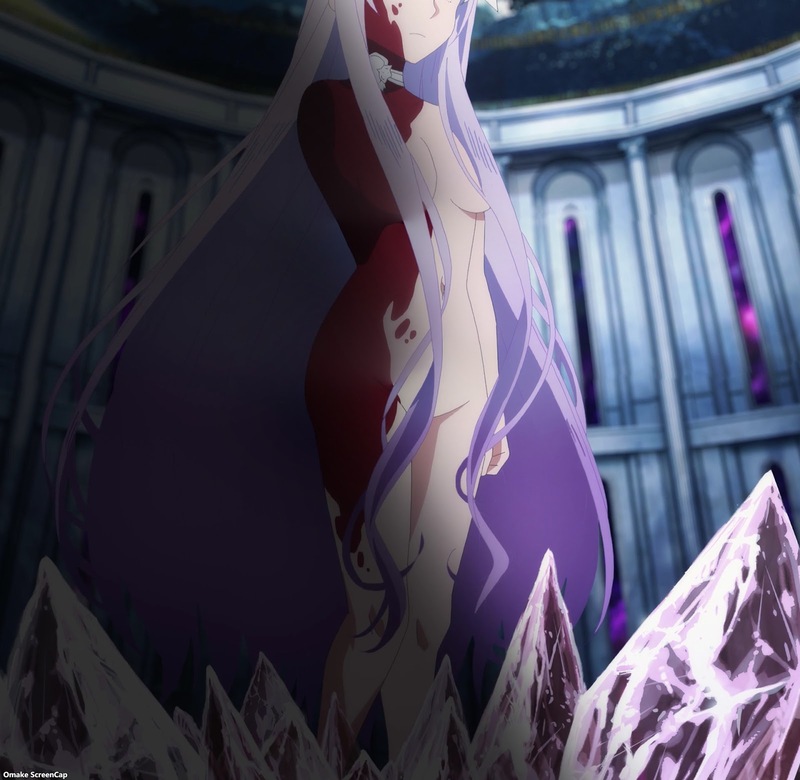 Maybe they're only letting Asuna see a small portion of the Under World project. Snooty mean girls are snarking at each other. Both Administrator and Cardinal hate their original character names. Confirmed - Administrator thinks the final load test is the Dark Territory invasion. Administrator is going to use half the human population to make her sword golems. That's no good. Using memory fragments to control robots - there's some implications for the fluctlight tech controlling the murderbots. There's too much self-sacrifice in this scene. There's no way Administrator is going to keep her promise and let the three kids live. Eugeo has an idea. It's probably a bad one, considering how his idea for beating Bercouli was to freeze himself too. Aw. That was a touching moment as Cardinal reached for Alice's hand. There's something deeper here with Eugeo's memory of the young Alice in the memory crystal. Eugeo's going full digital Jesus on the cross. He's going to let himself become a nonmetal sword to kill Administrator. Nuts. He got the Sword Golem and took one of Administrator's arms, but that wasn't enough. At least we know the weapons can regain their human shapes. The Blue Rose Sword froze up Eugeo's sliced body before it broke. Hard to tell if Eugeo is dead for real after all that. Administrator is so casual. She just made a sword with her cut off arm. She truly has lost her sense of humanity. Kirito finally got tired of girls taking the kill shot before he gets serious. Finally. That ceiling mural is spoilerific. There's an angel with a green sword right there as Kirito holds his green sword. Next time, Kirito gets serious. 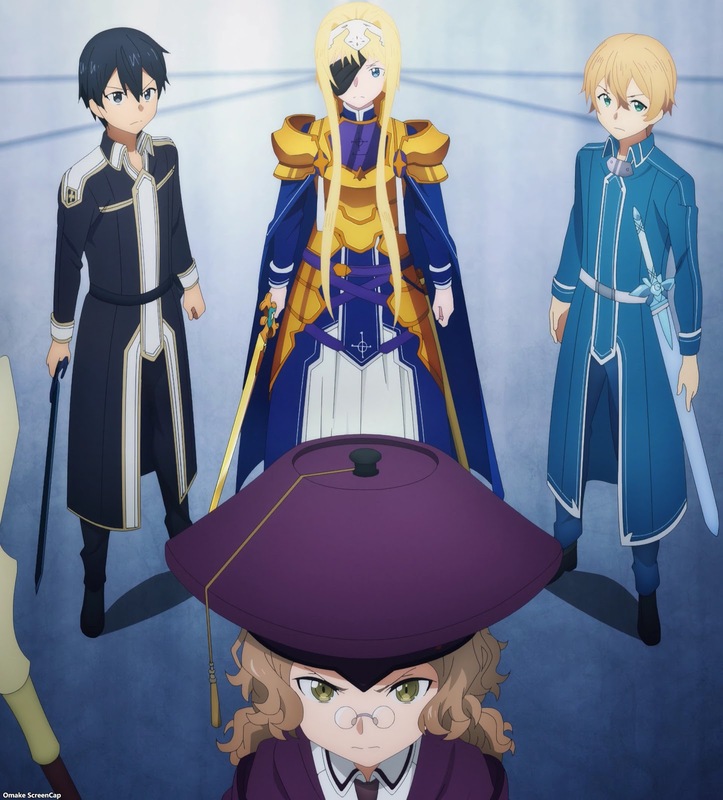 Also, I learned this Alicization story will continue in the fall season, so I don't think we're going back to the real world before the end of the final episode.